If the concrete surfaces surrounding your home have been neglected, call us today. We offer same day or next day service to clean your driveway, sidewalks, or patio. Power washing concrete is a safe and economical way to freshen dirty concrete surfaces. Over time, concrete turns dark from mold, mildew, dirt, and algae. The concrete surface around a pool area becomes slippery and unsafe due to neglected maintenance. Use our power washing service to clean those concrete surfaces preserving the safety of your family. Our eco-friendly cleaning solutions will clean and brighten all concrete surfaces. Your home’s appearance will be vastly improved. If you are planning on selling your home, you will definitely want to call us to clean neglected surfaces and to improve the value of your home. You will greatly appreciate the improved return on investment. We offer free estimates and a complimentary service call with a written estimate. Our concrete cleaning and sealing services cover all types of surfaces. By using our power washing service, you will be amazed at how much cleaner and brighter the concrete surfaces surrounding your home will look. Your sidewalks, patio, steps, driveway, garage floors, and pool area will be vastly improved. Your home will have a clean and pleasant appearance. Call us today, let us show you how we can improve and protect your home and yard. 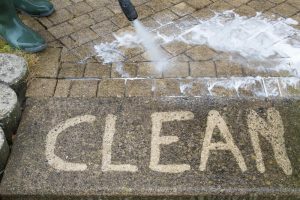 Protect your most valuable asset, your home, by using our experienced power washing service to clean and brighten those unsightly and neglected concrete surfaces.